thank you for this very interesting take on these roles "from the feet and eyes" - a wonderful change of perspective for someone like me, who, as well, belongs more to the crowd of "outside analyzers". Your look at the contradictions of youth vs. maturity in Nadal, eh, Romeo (what a match!) and Idamante now got me thinking in return - new footnote in the works... thanks! It's amazing how acting has become something important nowadays, compared to the 'old school' interpretations. Sutherland's Lucia has nothing to do with Dessay's, and Serra's Königin der Nacht, nothing to do with Damrau's. Cherubino is now able to free this phisical urge of his by moving around and approaching to Susanna and the Contessa, instead of just standing there singing how love is moving him from the inside. What about Octavian? He is one boy with a rather big dilemma! Do you think the feet and eyes only applies to pants roles? 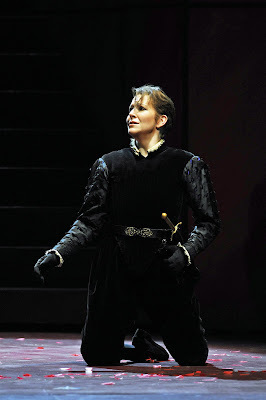 When you get to Donna Elvira, I really would like to know your insight on her. She is on my list of dream roles! Which is about a mile long. What a shocker! I hope Idamante is going well. Am glad to see I'm not the only one interested in your comment about eyes and feet. A stage director friend from Buenos Aires introduced me to the feet last winter when he told me about Tadashi Suzuki's "The Way of Acting." The first chapter is 'The Grammar of the Feet.' Any connection?! Yes, I would also like to hear comments about Rosina, having witnessed most all your extraordinary performances in Chicago. Ciao, and "muchas merde" in Madrid - wish I could be there to hear you! I second Suzanne: WHAT ABOUT OCTAVIAN? Take care and good luck with Idamante. So many roles, so little time, I'm afraid! There was no Octavian, because my friend didn't ask! But yes, I'm afraid he may take a full page all to himself! And just to elaborate on the feet and eyes - I suppose maybe I'm giving away all my trade secrets (not that I really have any!) but for me, the body follows the feet/walk, so there you have the physicality, and the eyes betray all the emotion (well, that which the voice isn't giving). Maybe it's a bit too simple, but it helps me keep things less complicated than we singers usually make them! What a wonderful post! Thank you for being such an inspiration to mezzos everywhere... especially this one in particular!! Aprapos of that "Non piu andrai"....It is precisely the use of gesture, posture, movement and look that you describe that so often enables Cherubino (whom you've probably, and if so most regrettably IMO, dropped)to steal the piece. This in spite of the veritable treasure trove of musical and dramatic riches the aria has for Figaro. That this is possible underscores the importance of this aspect of the art and its is absolutely fascinating to get your insight and perspective. 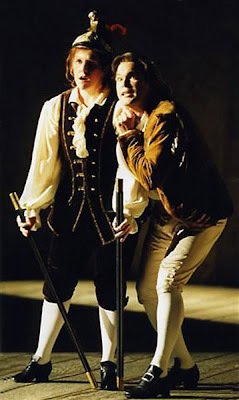 Incidentally I saw the Strehler Figaro in Paris in 1999 and it was and remains my favorite Figaro production (and I have something of a Figaro problem) and am thrilled that you like it as well (although you obviously have an understanding of it most of us couldn't even aspire to). Anyway thanks for the great post. I'm glad you're enjoying Madrid. (Oh and with the Don coming up in London see if you can manage to steal "Madamina" from Leporello.